On Wednesday, March 16, 2016, the Broome County Arts Council (BCAC), located at 81 State Street, Suite 501, Binghamton awarded $232,815 in United Cultural Fund (UCF) grants this year to 22 local arts organizations, community non-profits, and individual artists. BCAC announced the funding at a10:30am news conference today. For 2016, UCF grants will help support the operations of 7 major arts organizations, as well as 15 community non-profit and individual artist projects. Funded projects range from choral music to dance, classes to concerts, photography to printmaking, theatre productions to poetry and film festivals. Established to sustain the arts in Broome County, the UCF is the only active, locally-funded, combined campaign for the arts in south-central New York, and one of only 7 such programs in New York State. Major donors who invested in BCAC’s campaign for UCF 2016 include the Hoyt Foundation, Broome County government, Decker Foundation, Gaffney Foundation, M & T Bank, IBM, other local businesses and corporations, and a host of individuals. The 2016 Campaign raised a total of $278,459 85% of which is allocated to this year’s grant awards. BCAC receives 15% for administration. Last year, UCF grantees collectively returned more than $4.6 million dollars to Broome County’s economy. For more information, call 607-723-4620, e-mail lkdavis@broomearts.org or visit BroomeArts.org. "Tanzen und Singen: Music in Motion"
SPARE Productions presents "Letter Writing"
"Our Space" Threatening Rec Park Trees? Jen O'Brien, the planner for the Our Space renovation at Rec Park, stated emphatically that "only one tree will be taken down for Our Space." However, if you look at the pink paths that the crews are laying out many of the lines go right up to or in some cases through some of the trees. When asked, a member of the crew agreed that disrupting the roots of these trees will jeopardize the trees. The playground area is scheduled to be paved with permeable pavement. UPDATE!! We emailed the city for clarification but did not get an answer, but Councilperson Dani Cronce (D-3rd district) replied on Facebook with this answer: "Please understand, Legally we can not cut down trees!!!! This was a rough draft from a computer generated blueprint of where equipment will go. We will be correcting the issues that the computer miss computed. This is not the correct outline, we need it drawn to make corrections. Zoning is complicated for playgrounds." This is reminiscent of the last Rec Park renovation under the Bucci Administration (Rich David, Deputy Mayor then). Then the plan was to create a massive parking lot that rarely has more than a few cars in it, paved paths, and basketball courts. The construction did cut some of the roots of the trees, and 10-12 trees subsequently died. In one area along the Schubert St. fence becaue of the loss of several trees there is now a small wetland that after a big rain is deep enough for the ducks to swim in. Rec Park is one of the most popular parks in the city, the "Jewel in the Crown" according to Mayor David. That popularity is largely due to the oak forest on the Northwest corner of the park which provides some beauty and connection to nature. Yet, the trees are stressed due to their age--most are about 75 years old. Although there have been some planting of new trees in the last few years, each tree is valuable and should not be jeopardized by construction. Our Space is an ambitious 3/4 of a million dollar project that will put many features in the area north of the bandstand, including a tree house, a maze, seating, and play equipment on a paved section on the lawn. William Barber, Parks and Rec Director characterized it as "Disney" quality in the park. Construction will begin any day and recent estimates suggest it will be done by Memorial Day. With spring upon us it seems like the right time to announce the release of a new book project that I have been working on for about the past three years now, though at times it has felt even longer! Below is a description of the book. The book, Dead Reckoning: Transatlantic Passages on Europe and America (SUNY Press), is a co-written effort with my good friend and former colleague, Anthony Di Renzo (Ithaca College). The book is officially scheduled for release in May, though it is already available for Kindle on Amazon and the paperback is available for pre-order. What began as an email exchange between Anthony and me turned into a dialogic exchange consisting of prose poems and lyrical essays, and eventually became a book that I am extremely proud of and excited to share with you. Dead reckoning is the nautical term for calculating a ship’s position using the distance and direction traveled rather than instruments or astronomical observation. For those still recovering from the atrocities of the twentieth century, however, the term has an even grimmer meaning: toting up the butcher’s bill of war and genocide. As its title suggests, Dead Reckoning is an attempt to find our bearings in a civilization lost at sea. Conducted in the shadow of the centennial of the First World War, this dialogue between Romanian American poet Andrei Guruianu and Italian American essayist Anthony Di Renzo asks whether Western culture will successfully navigate the difficult waters of the new millennium or shipwreck itself on the mistakes of the past two centuries. Using historical and contemporary examples, they explore such topics as the limitations of memory, the transience of existence, the futility of history, and the difficulties of making art and meaning in the twenty-first century. This past Monday, Governor Cuomo called to halt the construction of the Algonquin Incremental Markets (AIM) Pipeline. This is a tremendous victory, and is the first time (I believe) a Governor has demanded a halt to construction of an interstate pipeline. We hope that this paves the way for to halt the Constitution Pipeline by denying the 401 Water Quality Permit. The Hollerans have been tapping the maple syrup on their land for some time, and had their trees taken by Constitution tree cutting crews, with heavily armed US Federal Marshals. This is an insane use of eminent domain to trample landowners rights. The tree cutting has happened before NY has granted all of the permits for the pipeline, including a 401 Water Quality Permit, which, if denied, could end the project. Please see Ecowatch's great coverage, and Gerri's really heartbreaking footage. Pick up the phone today and call Governor Cuomo and ask him to deny the 401 Water Quality Permit, 518-474-8390. One more thing: Our friends in Ithaca are doing awesome work highlighting infrastructure struggles, through Ecodefense Radio. Consider signing up for their newsletter!! When: March 4th at 7pm. Dani Cronce, Binghamton Police and BU police liaison are excited to create a neighborhood Crime Watch focused on the needs of the Westside residents. Residents and business owners are encouraged to attend this public meeting. We will have a public discussion on the implementation of an active and productive community watch. Residents will have time for questions and answers. “I am fascinated with materials that most would call waste and creating something new from them,” says Peg Johnston, an artist at the Cooperative Gallery in Binghamton NY. TRASH! invites other artists, both local and national, to join a first- ever exhibit of Eco Art in this area June 2- 25th, 2016. Works using any of a variety of waste materials from paper to plastics, fabric to scrap metal, styrofoam to recycled wood are welcome. Beyond use of non-traditional art materials, works in this show will bring attention to the plight of our environment and our role in both creating and remediating destruction. Submit jpegs of your work to m.r.johnston@icloud.com by May 15th, 2016. Accepted works must be received by May 26th for non-local works. There is no fee for entry, but the usual 20% commission to the gallery applies. 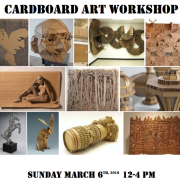 A series of workshops on Eco-Art media will lead up to the June exhibit: the first is "Cardboard Art" on Sunday March 6th from 12-4 pm, an exploration of cardboard as a sustainable and versatile medium. (Download flyer below) The second is a workshop April 9-10th with Bruce Greig on making sculpture out of styrofoam. Bruce has experience in set design after working on The Hobbit, The Lord of the Rings, and King Kong. The workshop will appeal to theater set designers. There is a $60 fee for the two day workshop. The third workshop is in Handmade Paper Making in May TBA. Says Johnston about this collaborative exhibit, “This show builds on my long term interest in giving voice to environmental concerns which I have addressed in the Book as Art show and the “Plastic is Forever” waterfall of water bottles in the Gallery’s Off the Wall show. It was immediately inspired by picking up fast food container trash in my neighborhood.” A series of workshops are planned to explore the re-use of various materials to create art. TRASH! takes its creative inspiration from several contemporary artists who are working in various media, all using materials found in the waste stream. El Anatsui of Ghana creates elaborate tapestries from flattened liquor bottle caps and other scrap paper. He says, “I have a desire to manipulate the material to get something else out of it.” He models a personal mission that encourages artists to look at everyday consumer products and see their potential as high art, as vehicles for expression that go beyond craft making or green initiatives. South African Mbongeni Buthelezi states, “I collect rubbish and create something beautiful from it. I collect something that has no value and give it new life.” He recycles plastic into his artwork. Bryant Holsenbeck of North Carolina says, “Americans continue to create more garbage, per capita, than any other culture, yet we are blind to our waste…. I collect many things, among them, bottle caps, credit cards, plastic bags, straws and lids, beach plastic and chop sticks. I use these everyday items to make work, which transforms the objects and surprises us.” She creates installations using massive amounts of discarded plastic and other materials as well as creating small animals, re-purposed books, and birds made of credit cards, all of which bring attention to our impact on the environment. Mark Bradford, of South Central Los Angeles creates monumental works using layers of paper found on streets and from discarded materials. His work has been displayed worldwide and in prestigious museums. Rosalie Gascoigne (1917-1999) used different materials in distinctive grid patterns and other assemblages. “Through the artist’s skill in making poetry of the commonplace and her intrinsic response to both her chosen materials and the particularities of the Australian landscape, we are able to witness her unique ability to evocatively capture and convey the essence of nature and the transitory and captivating effects of light, air and space,” according to a review of a 2009 show. Broome County has been home to many and has a rich history. 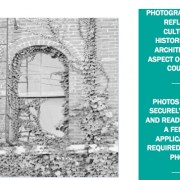 In the "Everyone Has A Hometown" Photography Contest, sponsored by the Preservation Association of the Southern Tier, we invite you to submit original photographs that highlight and celebrate the historical, architectural and cultural uniqueness of Broome County. Through this competition we hope to advocate, educate and encourage civic engagement. All entries will be on display at the ART Mission and Theater gallery beginning on May 6th and throughout the month of May. Entrants may bring their framed photography to the ART Mission and Theater, 61 Prospect Street, Binghamton (www.artmission.org). All photos must be of Broome County. Applications will be available at the ART Mission, at the PAST Salvage Center, 21 North Depot Street and PAST’s web site (www.pastny.org). Each photo requires a short application and a $15 entrance fee. Students in high school or middle school will have a $10 fee. Make checks payable to PAST. Photos need to be framed and ready to be hung. A 3x5 card needs to be attached to the back of the frame and be filled out with the title of the picture, the location, and the photographer’s name, email address and phone number. Note: The photographer does not have to be from the town that they photograph. Judges will use the number assigned to the frame to determine winners.